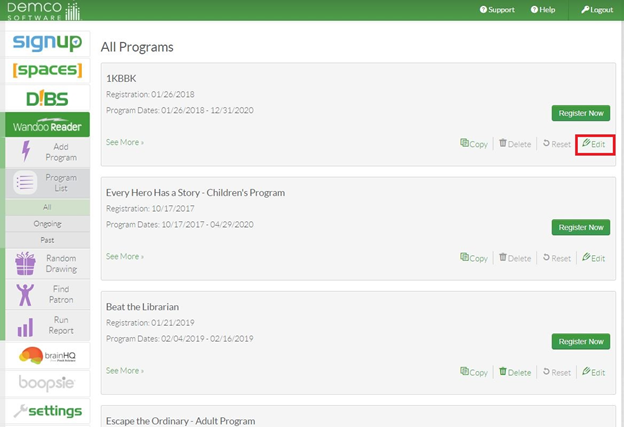 In Wandoo Reader, once a program has registered patrons, the system locks down the Reset, Delete, Logging Type, and many other key essential information. There are two options to do this process. However, before proceeding, please be sure that you have ran all reports needed for your program. Once you delete/remove the program data from the system, it cannot be recovered. Search for the patron under Find Patron, click Delete, then click Remove from specific program, select the program you wish for them to be removed from. Click continue and be sure to click yes from there. This will keep the patron record in tack, however, the reading logs, completed challenges and awards will be removed from this specific program. 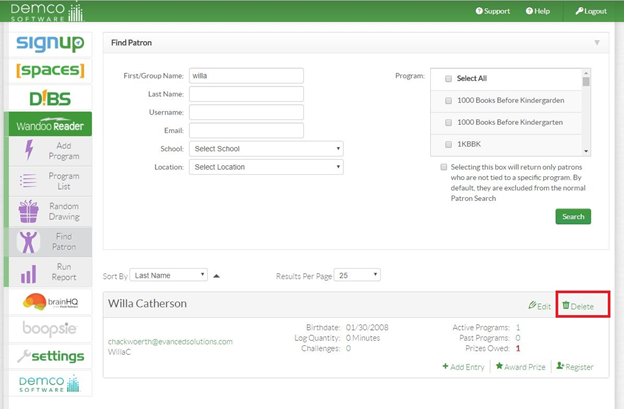 Once you edit the changes within the program, you can then go back to Find Patron and search for the patron again. If they had no other programs associated with them, then you will need to click the check box that is shown below the list of programs. Click Register and select the program again. Please note that patrons can use the same username/password at multiple libraries across the United States who also use Wandoo Reader, so we highly recommend not deleting the patron completely, just removing them from that specific program. Go into Program List and click Edit the program. 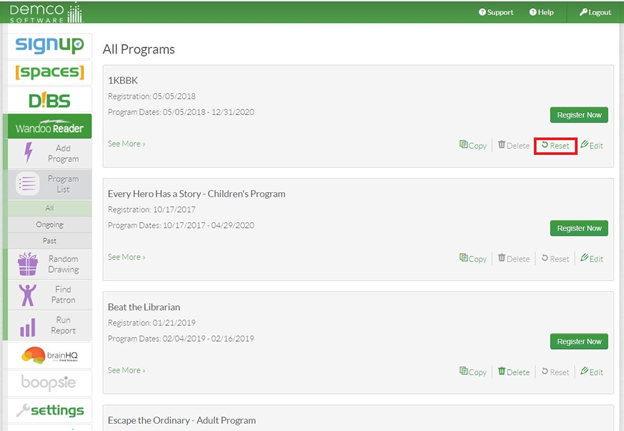 Move the Program Start, Program End, and Registration Dates to future dates, and click Save. Go to Program List and the Reset button should become active. Click the Reset button, and this will remove all patrons and their data from the program. Once you Reset a program, you then have the ability to Delete the program. Please note: If the patron is not associated with any other program, it will complete erase their account from the Wandoo Reader system.